Clan Badge: A greyhound couchant within two branches of bay all proper. (Clan Arthur sans the hound). The clan traces its descent from the Clan Campbell. During the reign of Alexander III of Scotland (r.1249-1286), the Clan Campbell made its first appearance, and was dived into two branches Mac Cailinmor and Mac Arthur. The nineteenth century historian William F. Skene wrote that during the reign of Robert I of Scotland (r.1306–1329), the Mac Cailinmor branch (the Campbells) did not possess any land in what is now Argyll, while Mac Arthur, head of the Mac Arthur branch was in possession of extensive territory in the earldom Garmoran, which was the original seat of the Campbells. Skene wrote that "it is therefore impossible to doubt that Mac Arthur was at this time the head of the clan, and this position he appears to have maintained until the reign of James I." Arthur Campbell, of the Mac Arthur branch, along with Neil Campbell, of the Mac Cailinmor branch, supported Robert the Bruce and were richly rewarded by the king with the forfeited lands of his opponents. Arthur Campbell was made keeper of Dunstaffnage Castle along with extensive territory in the district of Lorn. Later, during the reign of David II of Scotland, the Mac Cailinmor ever becoming more powerful, since the marriage of Sir Neil Campbell with a sister of Robert I, were resisted from taking control of the clan by the Mac Arthur branch with the obtaining of a charter "Arthuro Campbell quod nulli subjictur pro terris nisi regi," by Arthur Campbell. In 1427 James I held parliament at Inverness and summoned the Highland chiefs. John MacArthur, the chief of the MacArthurs, was one of the unlucky chiefs who were executed by the Scottish King. With the execution of John MacArthur, and Alexander, Lord of Garmoran, the MacArthurs lost possession of all their lands with the exception of Strachur and lands of Glenfalloch and Glendochart in Perthshire. From this time, and on, the Mac Cailinmor branch were the head of the clan and the Campbells continued their rise in power. In 1771 with the death of Patrick MacArthur, Chief of the Clan Arthur, who died in Jamaica without an heir, the title of Chief of Clan Arthur ceased to exist. Much later in the 1930s, Niall Campbell, 10th Duke of Argyll did a considerable amount of genealogical research on the clan, and finally in 1986 Hugh Peskett was commissioned to search for a Chief of Clan Arthur. 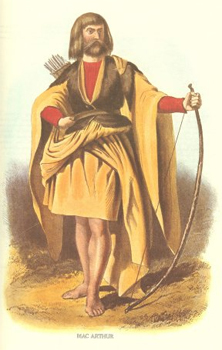 The research concluded that the chiefly line of the MacArthurs, the MacArthurs of Tirivadich could be traced as far back as 1495, to a John MacArthur of Tirivadich. Peskett's research could trace the chiefly line nine generations down from John MacArthur, through his eldest grandson Duncan MacArthur of Tirivadich, and three generations through John MacArthur's younger grandsons; Niall MacArthur of Querlane and John MacArthur of Drissaig. Research showed the main line had become extinct but Peskett was eventually able to uncover a descendant through John MacArthur of Drissaig; a Canadian born man named James Edward Moir MacArthur. James Edward Moir MacArthur was able to prove his ancestry to a Margaret MacArthur Moir who died about 1775. A great nephew of hers, Archibald MacArthur Stewart, recordered Arms in 1775 and traced his descent from John MacArthur of Milton, who died in 1674. Hugh Peskett's research linked John MacArthur of Milton back to John MacArthur of Drissaig. 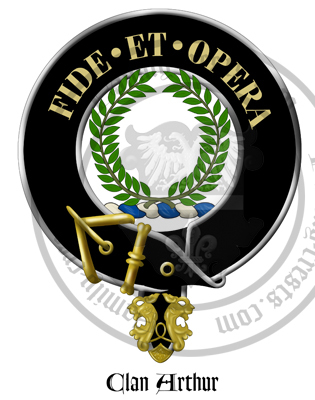 In 1991 a derbfine was organized and James Edward Moir MacArthur was elected as Commander of Clan Arthur. Ten years later James Edward Moir MacArthur successfully petitioned Lord Lyon, and in August 2002 was recognized James Edward Moir MacArthur of that Ilk, Chief of Clan Arthur. James Edward Moir MacArthur was the first Chief of Clan Arthur in 231 years. Upon his death in 2004, he was succeeded by his son, John Alexander MacArthur of that Ilk, as Chief of Clan Arthur. Current Clan Chief: John Alexander MacArthur of that Ilk. Arms: Azure, a maltese cross argent, between three antique crowns or. (Clan Arthur sans the cross). Crest: A greyhound couchant within two branches of bay all proper. (Clan Arthur sans the hound). 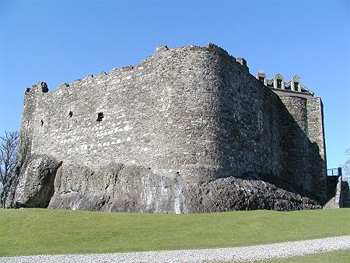 In the fourteenth century Arthur Campbell was appointed keeper of Dunstaffnage Castle. Warcry: Eisd! O'Eisd! - Listen! O Listen!